I’ve been slacking on posting in the blog (again), but now that the sun is setting ridiculously early and the cold weather has set in, I predict that I’ll be staying at home more often in the comfort of home and writing away! Today has been one such day, so I finally put together the recipe for my acorn squash and veggie enchiladas that I posted a couple of weeks ago on Instagram. The cool thing about this recipe is that it can be adapted in many different ways: corn tortillas (gluten-free) or flour tortillas (not gluten-free), red enchilada sauce or green, veggie filling or meat, vegan cheese or regular cheese. The husband and I had completely different enchiladas, but it worked out perfectly because we each had a pan to ourselves to eat for many meals that week. For those who have similar households with both vegetarians and meat-eaters: I made a big pot of the filling and then split it in half, so that Ashok could add meat to his. It is super easy and does not require a ton of effort to make it work for everyone. Another thing to note: the recipe written below is for my gluten-free and vegan version. Because I used corn tortillas, my enchiladas were more of an “enchilada casserole,” since corn tortillas are a bit difficult to keep rolled up. If you use flour tortillas, feel free to roll them up as you would for traditional enchiladas. With that – here is the recipe. I hope you enjoy these as much as we did! Prepare the acorn squash by either microwaving or roasting. I microwaved the acorn squash for sake of time, so the following directions are specifically for microwaving the squash. Cut the squash in half and remove the seeds. Place one half on a plate, cut side down, and microwave for 10 minutes. Repeat with the other half. Allow the squash to cool, and scoop the squash out of the peel and set aside. Prepare the filling. Turn the stove on to medium-high heat and place 1 tablespoon of olive oil in a large pot on the stove. Add the minced garlic. After 30 seconds, add the black beans, corn, olives, and spinach. Cook until the spinach softens, then add the cooked acorn squash and the salt/pepper/taco seasoning. Mix well – the squash may become mashed as it mixes with the rest of the filling. Spray a baking pan with olive oil or oil of choice. Pour 6 generous spoonfuls of enchilada sauce into the pan, ensuring that the entire bottom of the pan is covered. Place a layer of tortillas in the pan. Add a layer of filling to cover the tortillas, followed by a thin layer of shredded cheese. Add another thin layer of enchilada sauce, a layer of tortillas, filling, cheese, and so on, until the pan has been filled up. End with a layer of tortillas, followed by enchilada sauce, and a generous amount of cheese on top. Cover the pan with aluminum foil and bake for 30 minutes. Then, remove the foil and bake for another 5 minutes. Enjoy with a side of salsa or guacamole. As I’m sure you have noticed, ever since I recently revived my blog, I’ve been focusing less on recipes and more on other topics. Not to worry, though, because I do have some recipes tucked away that I’ve been planning to share with you. This is one such recipe. We made this crockpot vegan gumbo a few weeks ago when the weather had begun to cool down, and it was just perfect. 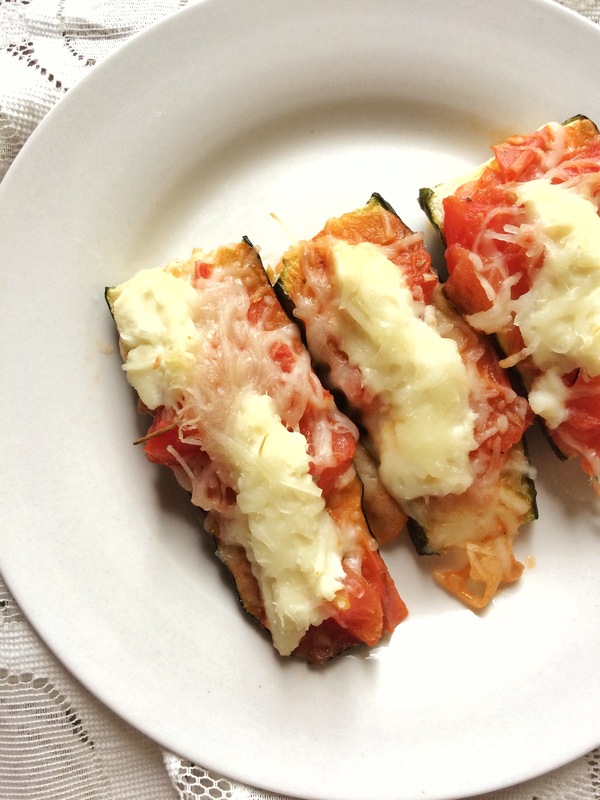 It is filled with veggies, and picky eaters might not even notice how healthy this dish is. Any source of protein can easily be added to this gumbo, and it can be served with brown rice, white rice, or quinoa. The best part is that the prep time for this recipe is essentially negligible – just throw everything together in the crock pot and let it cook for the next several hours! Chop the bell pepper, carrots, and celery. Dissolve the bouillon cube in ½ cup water, and pour into the crockpot. Place all ingredients except for the liquid smoke into the crockpot. Cook on HIGH for 4 hours or 8 hours on LOW. Stir in the liquid smoke after the cook time has completed and serve warm. I promised you a variety of different topics here on the blog. Today I’ll be discussing a topic that I have lots to say about – my Ayurvedic experience. The reason for writing about this is twofold. 1) It’ll give you a bit more background about why I eat the way I do and a bit more insight about why I became so into yoga; and 2) it has made such a profound impact on my lifestyle, and I hope that sharing about it will help somebody else. This is likely going to be a topic that will span multiple posts, so I will start by giving you a bit of background about why I even approached Ayurveda in the first place, and then going into detail about what Ayurveda is. It all started when my stomach did not cooperate with me. Years of stomachaches and not knowing why it was happening or what was going on. In 2014, I had several months of consistent stomach issues, and finally decided to go to the doctor. A series of blood tests was performed and all came out negative except for the one for Celiac Disease, which was positive. I then went to a gastroenterologist who performed a genetic test to confirm that I did in fact have Celiac Disease. The test came back positive. Ever since then, I’ve been on a gluten-free diet. The new diet helped for a bit, until the stomachaches started again less than a year later. I went back to the gastroenterologist with a list of foods that were not agreeing with me. The response I received, after testing negative for SIBO (Small Intestinal Bacterial Overgrowth) was just to eliminate those foods. I was so frustrated and ready to get some answers. A relative was familiar with my situation and suggested to me to approach an Ayurvedic practitioner. I was open to anything, so I went for it. What is Ayurveda? I always tell people that it is “Indian holistic medicine.” But to give you a bit more detail: Ayurveda is a mind-body health system which originated in India over 5,000 years ago. Ayurveda is a science of life (in Sanskrit, Ayur = life, Veda = science or knowledge) and places emphasis on creating a state of balance with the mind and body. In Ayurveda, there are three types of energy that are found in everyone and everything: vata, pitta, and kapha. These energies play a role in the balance and imbalance that happens in our bodies and minds. There are many factors that act to create imbalance in our bodies, and Ayurveda helps us to understand when our body is in an imbalanced state, and how to bring it back in balance. To summarize: Balanced = healthy/ordered. Imbalanced = disease/disordered. What really stood out to me about the Ayurvedic system was how personalized the approach is. It is not about treating symptoms; rather, it is about assessing each person’s lifestyle as a whole by evaluating nutrition, sleep, exercise, work schedule, stress levels, and so much more. The three types of energy come into play as well, as typically everyone has one or two dominant energies, which dictate how the body responds when it is imbalanced. This then gives us an idea of what needs to be done to shift the body to a balanced state. I hope I haven’t lost you yet! TL;DR: The Ayurvedic system of medicine evaluates each person individually, getting to the root of the issue rather than treating a symptom. This appealed to me after unsuccessful experiences with Western medicine. I think that’s enough background for now. Stay tuned for the second post in this series, in which I will delve a little bit deeper about what I learned about my body type and how that impacted my diet and lifestyle. When people find out about my slew of dietary restrictions (vegetarian, gluten-intolerance, peanut allergy), and that my husband eats everything but is lactose-intolerant, questions are always asked. So, I’ve decided to write a series of posts about what it is we eat, and how I meal prep to accommodate for all our dietary restrictions, in the hope that this will help others who are in similar situations. For the first post in this series, I’ve decided to capture what our meals at home look like. I am a huge fan of meal prep, so our meals are usually prepped during the weekend and assembled and eaten during the week. I have attempted to use my gluten-free/vegetarian diet to my advantage, and have become more creative with my recipes. Luckily, Ashok is not a huge bread or pasta person, which makes coming up with recipes that are suitable for both of us a bit easier. I also tend to drift towards cuisines that are naturally gluten-free (i.e. rice based, corn based, etc). As far as the meat, we always find meals that are vegetarian at baseline, and can easily have meat added to them. Here are some examples of our meals from the past couple of months. Loaded Vegan Nachos. With roasted sweet potato, a vegan “cheese” sauce, pinto & black beans, red cabbage, pico de gallo, guacamole, olives, green onions, jalapeños, and cilantro. Pictured above are the nachos with store bought corn tortilla chips; my plate included my homemade baked corn tortilla chips. The meat addition was ground beef. Spring Roll Bowls. With rice noodles, mixed greens massaged with olive oil and sea salt, carrots, cucumber, red bell pepper, red cabbage, pickled ginger, pineapple, jalapeno, and baked tofu. These bowls were drizzled with a sunflower seed butter sauce. The meat addition was pork. Fajitas. Sautéed veggies (carrots, mushrooms, green peppers, zucchini) and salsa atop corn tortillas, with a side of Mexican rice and refried beans. The meat addition was steak. Acai bowls for weekend breakfast! The base included acai packets blended with frozen banana, frozen blueberries, frozen strawberries, frozen raspberries, and almond milk. The toppings were fresh blueberries, fresh strawberries, almonds, granola (gluten-free for mine), shredded coconut, and a drizzle of honey. Stuffed Peppers. Green, red, and yellow bell peppers stuffed with a mixture of sautéed garlic, tomatoes, black beans, corn, spinach, olives, and tomato sauce, seasoned with taco seasoning and ground cumin. These peppers were topped with cheese prior to baking. No meat was added for this dish. Sushi bowl. Sushi rice, microgreens, tofu, carrots, cucumber, edamame, avocado, and pickled ginger topped with roasted seaweed, black sesame seeds, and a sriracha mayo sauce. The meat addition was salmon. Grilling season meals. The veggie option was a grilled portobello mushroom and the meat option was grilled shrimp. Sides were potato and sweet potato baked fries and garlic peas. Fried brown rice. A simple egg fried rice with mixed vegetables, seasoned with gluten-free soy sauce, sesame oil, and sesame seeds. No meat was added to this dish. Stay tuned for part 2 of this series! I’d love to hear your comments and questions on this topic, or if you have any ideas or recipe inspiration. I took a small (okay, maybe not so small) break from blogging to focus on other things. However, I’ve decided that I’m ready to start writing again, and I’ve also decided to share more than just recipes here. While I do plan to share with you more of my favorite gluten-free/vegetarian recipes, I will also share tips on how a GF/veg and a carnivore eat together, my personal health and wellness journey, and some fitness-related topics. -We did a lot of traveling around the country to attend friends’ weddings. -We had our own wedding in April of this year, followed by the most relaxing honeymoon in Maui. -We’ve had lots of Seattle adventures – including food, hiking, and exploring. -We got an Eskipoo (American Eskimo + miniature poodle mix) puppy named Kenobi! -I squeezed my way into the Seattle fitness community and have been teaching and taking lots of yoga and fitness classes. Seattle is such an inspiring city for both yoga and fitness. -I wrote this article about my favorite GF pizzas in Seattle and was interviewed in this podcast on GlutenfreeGlobalicious Magazine. -I decided to see an Ayurvedic (Indian holistic) practitioner a few months ago, which opened my eyes to so much regarding my own body, and how food is not the only factor that impacts digestion. More on this later – I plan to write a whole post on this topic. I have more updates but those will be coming to you soon. In the mean time, if there is something specific you’d like to see, let me know – I would love to hear your suggestions! Hey there! You were probably wondering if I would ever return to this little spot with some new words of wisdom and/or new recipes. Well I can at least promise you a new recipe today! 1. I’m officially in the scenic, amazing, not so rainy (yet) city of Seattle! While there is still so much to explore, the food and fitness scene is absolutely great. It is an extremely active city (just my style!) and there are a ton of gluten-free and vegetarian food options. 2. If you follow me on Instagram (@karmaeats), you might already know that I’ve changed up my cooking style a little bit. I still make healthy Indian cuisine from time to time, typically for my lunches that I take to work! However, weeknight and weekend eats include more variety and are heartier – still gluten-free/vegetarian – but easily adapted for meat-eaters as well. This means that meat can easily be added, or the meal might even be satisfying for carnivores without the meat. With that said, I actually do have an Indian-ish style lentil dish to share with you today. I am slightly lazy when I cook, and prefer not to have to soak lentils beforehand; hence, the use of these brown lentils which cook relatively quickly. In a large pot, heat the coconut oil over medium heat. Add the cumin seeds, and once they begin to sizzle and brown, add the cumin-corriander powder and garlic. With a large spoon or spatula, mix the spices around in the pot until the garlic becomes slightly browned but not burnt. Then, add the ginger. After one more mix, add the crushed tomatoes, along with the turmeric, salt, and pepper. Be careful here – it may splatter! Stir the mixture for approximately five minutes. It will be bubbling a bit. Add the lentils and water to the pot, along with the chili powder. Stir everything together. It will look very watery at this time. Cover the pot and turn the heat down to low. Turn a timer on for 40 minutes. Note: I found it helpful to check on it every 5-10 minutes and give it a stir. The lentils will begin to absorb the water, but if at any point more water is needed feel free to add more. I did not need to do so. After 40 minutes, check that the lentils have absorbed the water. Add the coconut milk, stir once more, and cover the pot. Allow it to cook for an additional five minutes. If any additional salt is desired, add it here. Remove the pot from the heat. Serve with rice or quinoa (yes, I used white rice this time – so unlike me!) and garnish with cilantro. Hey friends! How is summertime treating you? On my end, there’s been lots of travel (with more to come! ), lots of yoga, and of course, lots of food. While I have not been the best at photographing what I eat, I promise that I have not only been eating but also cooking. Usually, I go into the grocery store with some kind of a plan – generally, broken down into lunches, snacks, and dinners. From that plan comes my grocery list. Lately, I have no plan. And when I am plan-less, I am confused. Yesterday, I walked aimlessly through the grocery store trying to figure out what the heck I wanted to eat this week. 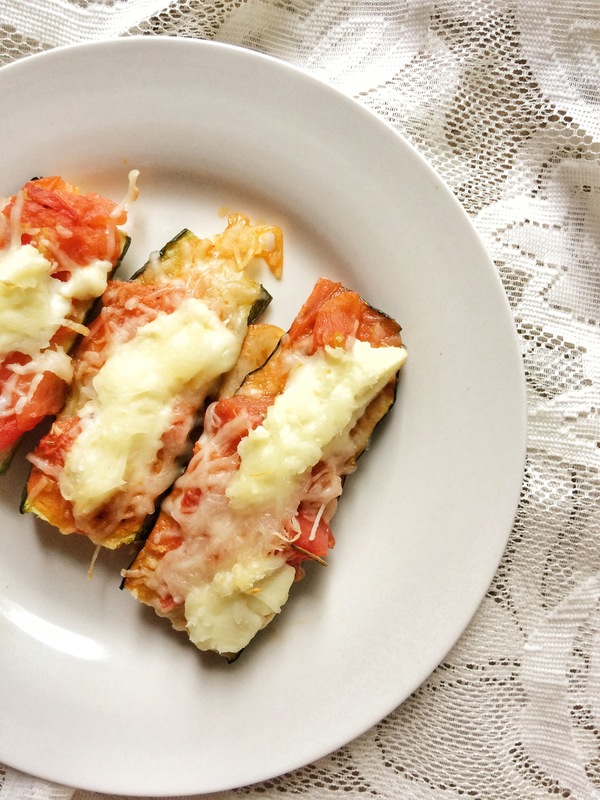 And out of thin air came the thought of zucchini pizzas. Probably because I’ve come across this idea a few times via social media. Well, I decided to come up with my version of it. Here it is, completely from scratch (including the sauce!). I thought it came out tasting pretty delicious, and I hope you enjoy it, too! 3 zucchinis, chopped in half width-wise, and then again lengthwise. (If the slices are too thick, slice again lengthwise). 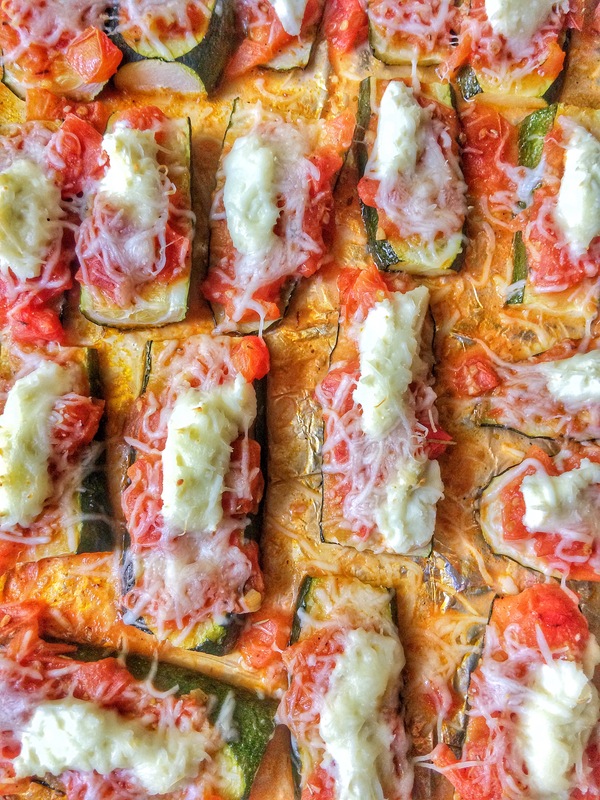 Place the zucchini slices on a foiled + greased baking sheet. Spray the zucchini with olive oil and sprinkle with salt and pepper. Place in the oven for 20 minutes. After 20 minutes, remove, flip the slices over, and bake for another 10 minutes. To make the sauce: place the olive oil and garlic in a large pot over medium-high heat. When the garlic has softened (do not burn!) pour in the chopped tomatoes. Stir frequently for 6-8 minutes until a sauce has formed. Season with salt, pepper, and rosemary. Remove from heat and set aside. To assemble the pizzas: pour a spoonful of sauce over each zucchini slice. This may get messy, but it’s okay! Place a spoonful of ricotta over each slice. Place the pizzas in the oven for 5 minutes. Remove, then add a sprinkle or two of mozzarella over each slice. Place back into the oven for another 5 minutes or until the cheese has melted. But I decided to document this particular recipe because it was my first time making actual dal and I was pretty proud of myself. And if I can manage to do this, so can you. 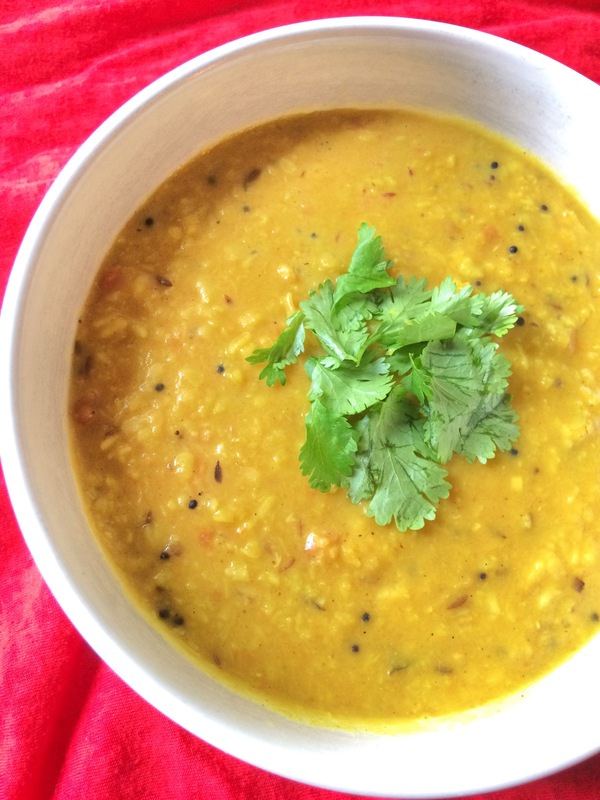 If you are new to Indian food, you are likely wondering what this “dal” is. Dal in Indian cooking refers to lentil dishes. There are a lot of different types of dal – this one in particular, moong dal, is one of the easier ones to cook, so I would suggest starting with it! Cook the moong dal – combine it with the water and boil it in a pot on the stove until the lentils have absorbed all of the water. (A pressure cooker can be used to cook the lentils as well, but I prefer the stove top method). Once the dal has cooked, set it aside. Place another, larger pot on the stove and set the heat to medium-high. Add the ghee, mustard seeds, and cumin seeds to the pot. Once the seeds begin to pop, add the ginger, garlic, curry leaves, and green chilis (if using). When the garlic and ginger have begun to soften, add the tomatoes. Stir until the tomatoes soften. Add the turmeric, salt, pepper, and the optional chili powder. Pour in the cooked dal, and slowly begin to pour in the additional water; be mindful as the entire cup of water may not be used. Stir and allow the dal to cook until it begins to bubble, then turn the heat off. Garnish with lemon juice and chopped cilantro, and serve with brown rice or quinoa. I am so excited (as usual) to share this recipe with you. While most Indian food is naturally gluten-free, there are a few favorites that are not. One such item is the well-known samosa. While I do miss eating the occasional samosa, the main reason I am not FOMO about it is because I don’t do well with fried food. Somehow, the lack of fried food in my diet has made me prone to stomachaches when I do eat fried food! What a problem. Disclaimer: I can’t take the credit for this idea. My mom and I share recipes with each other all the time, and I introduced her to the idea of making Asian-style spring rolls a few years ago. Recently, she turned it into an Indian-style dish, and of course, I followed in her footsteps. This is my take on it! I did not intend for this to become a samosa makeover, but it tasted so much like a samosa, I couldn’t resist naming it as such! Place a large pot on the stove and set the heat to medium-high. Pour the olive oil, cumin seeds, and asafoetida into the pot. When the seeds become fragrant (about 1 minute) add the potatoes and peas. Stir once and cook for a few minutes until the peas have thawed. Then, add the paneer and remaining ingredients. Stir and cover for 5-10 minutes, until the potatoes have softened. Remove from heat and allow to cool. Take one spring roll wrapper and place three spoonfuls of the paneer mixture onto the top third. Roll it up! Continue to make as many rolls as desired. Serve with chutney (even better if you can find a store-bought version). Enjoy! Happy New Year! I hope you all had an amazing New Year’s weekend. I am currently mourning the fact that holiday time is over and it’s back to reality. But, I will admit that I am excited for the year to come. If you know me personally, you’ve probably heard me say these two things: 1) I don’t do New Year’s resolutions and 2) I like greens but I am not a fan of kale. Why is this relevant? Well, 1) I like goals, because goals can be made at anytime, not just at the beginning of a new year. So one of my goals this year is to post more frequently on this little site! I fell off a bit during yoga teacher training, but now I am back and ready to go. 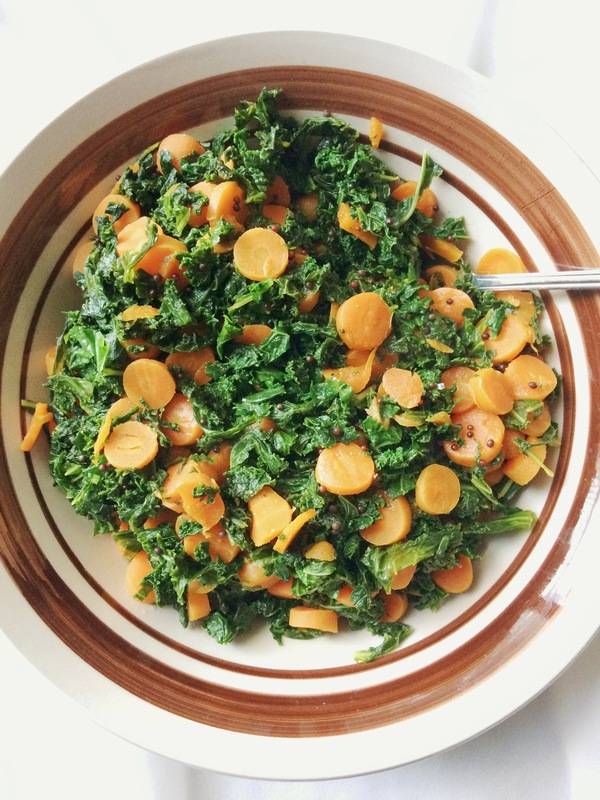 2) The recipe I am sharing with you today stars the ever famous kale. While I much prefer other greens such as spinach or collards, I like kale when it is flavored correctly, and this version of it actually worked for my tastebuds! I hope this works for you, too. It will be perfect for your healthy eating resolutions! Wash and chop the kale as desired. I cut it finely to avoid large leaves in the dish. Chop the carrots into small slices. In a large pan or cast iron skillet, melt the clarified butter. Add the mustard seeds, asafoetida, and curry leaves. 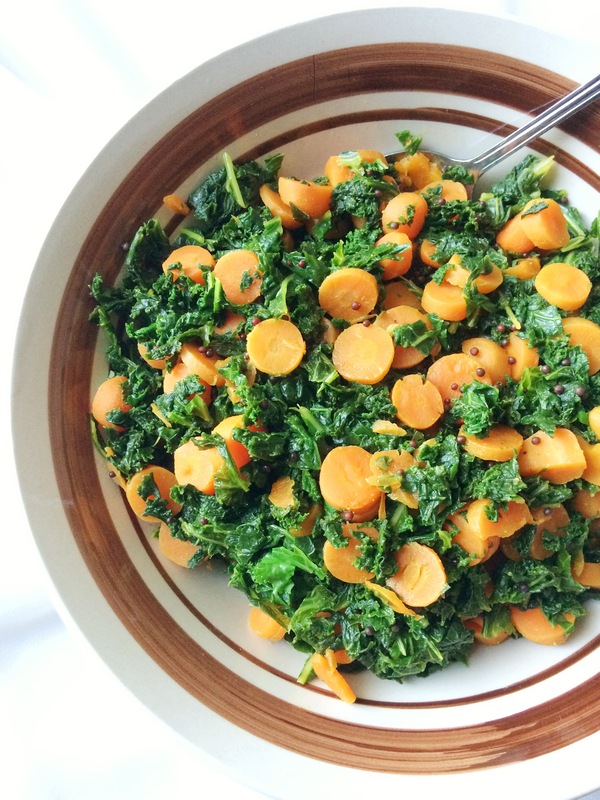 When the mustard seeds begin to pop, add the kale and carrots. When the kale begins to wilt slightly, add the remaining ingredients (turmeric, cumin-corriander power, salt, pepper, and if adding, coconut and chili powder). Stir to combine everything and allow it to cook until the kale has completely wilted. Serve with brown rice or quinoa and a side of yogurt. Or, enjoy on its own.